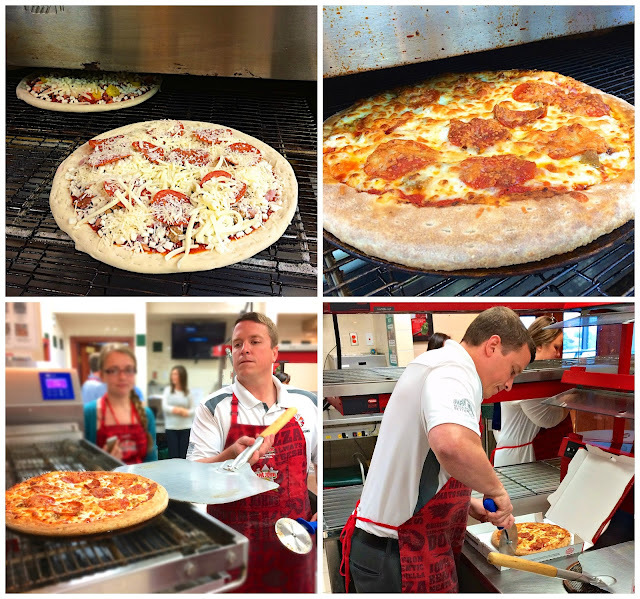 Behind the scenes at Papa John's Pizza headquarters in Louisville, KY. 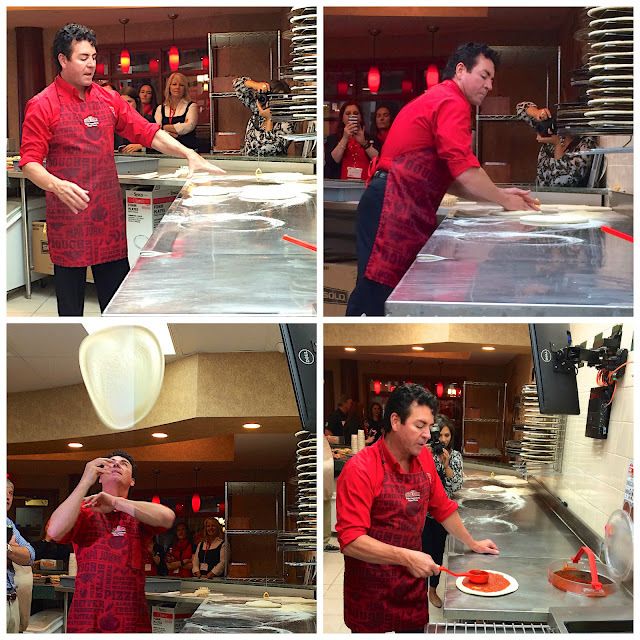 I learned all about their ingredients and how to make a pizza from Papa John himself. Papa John’s has no trans-fats, no MSG, no fillers in its meat toppings, no BHA, no BHT and no partially hydrogenated oils. 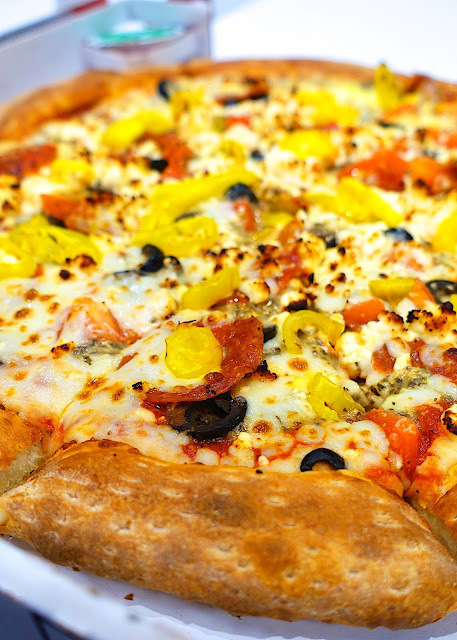 They use fresh, never frozen original dough and cheese made from high-quality, 100-percent mozzarella and skim milk. 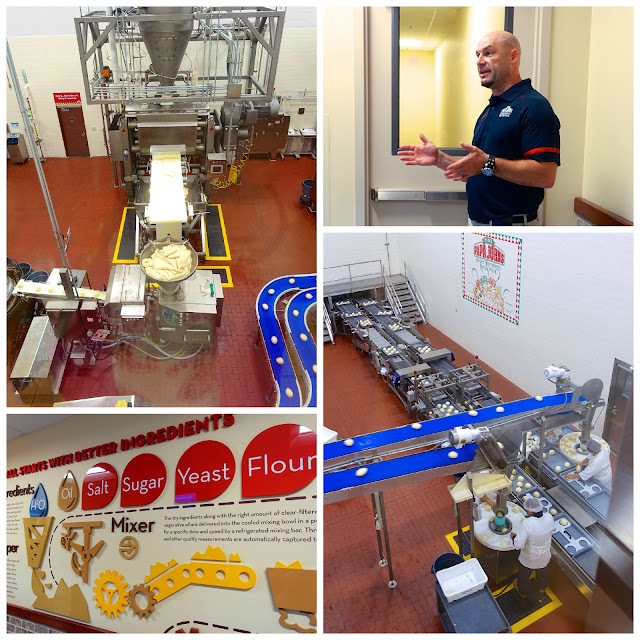 Last week I had an amazing opportunity to get a behind the scenes tour at the Papa John's Pizza headquarters in Louisville, KY from none other than Papa John himself. It was a dream trip. Pizza is my all-time favorite food. Papa John's Pizza was the first delivery pizza place in Auburn. I've been eating it for a really long time. I was beyond thrilled to get the opportunity to go to the headquarters. 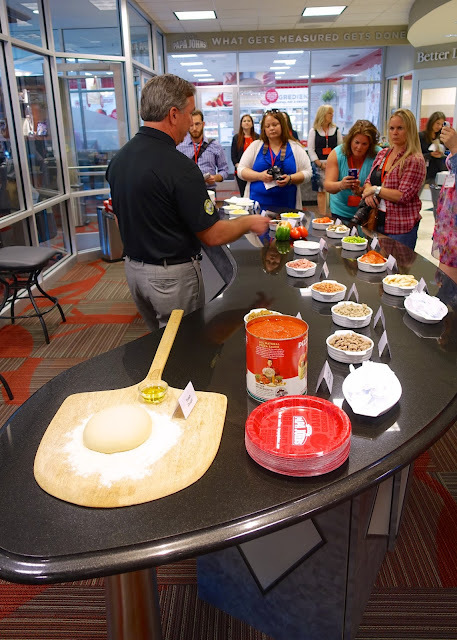 On the tour, we learned all about Papa John's Pizza's ingredients, quality testing and how to make a pizza the Papa John's way. I had the best time. I came away with a whole new respect for Papa John's Pizza and the company itself. Papa John spent the entire day with us. I was beyond impressed. I've worked for a lot of different companies in my career, all much smaller than Papa John's, and the CEOs wouldn't even give you the time of day. For Papa John, CEO and founder, to take time out of his day to show food bloggers around the headquarters was unbelievable. He knew everyone's name in the company and was so passionate. I actually texted Chicken Legs while I was walking around that I wanted to move to Louisville and work for Papa John's! I would have given Papa my resume if I had a copy of it with me. I must have drank some Papa John's Kool-Aid while I was there! LOL! 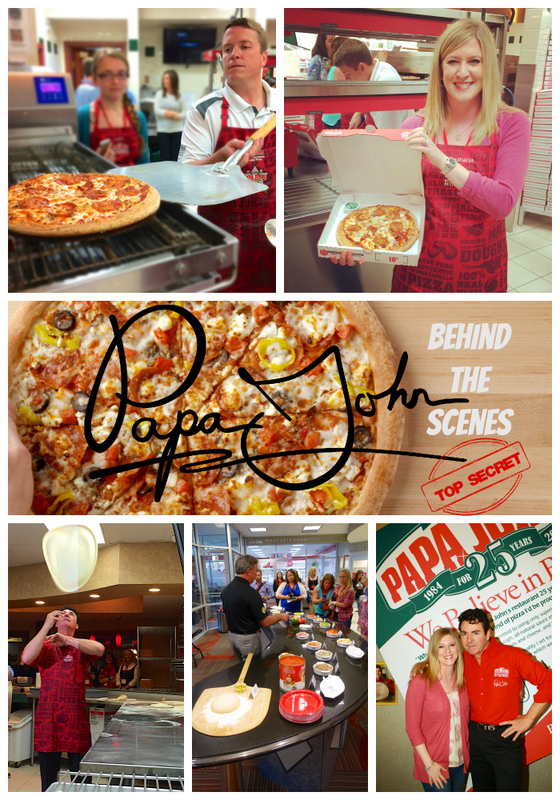 Keep reading to see behind the scenes at Papa John's Pizza headquarters! We arrived at the Papa John's headquarters first thing in the morning. 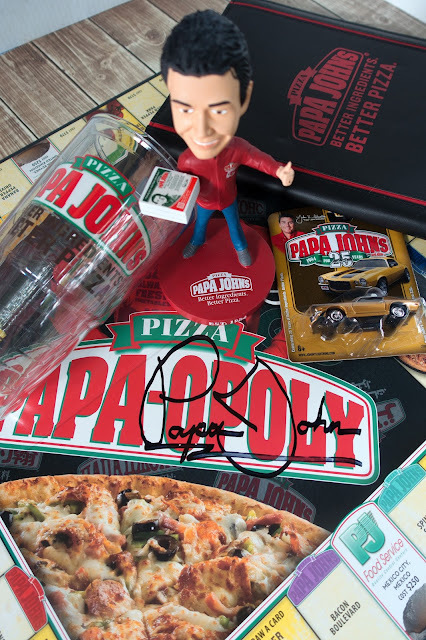 When you walk in the lobby, there is a whole area of Papa John's memorabilia. 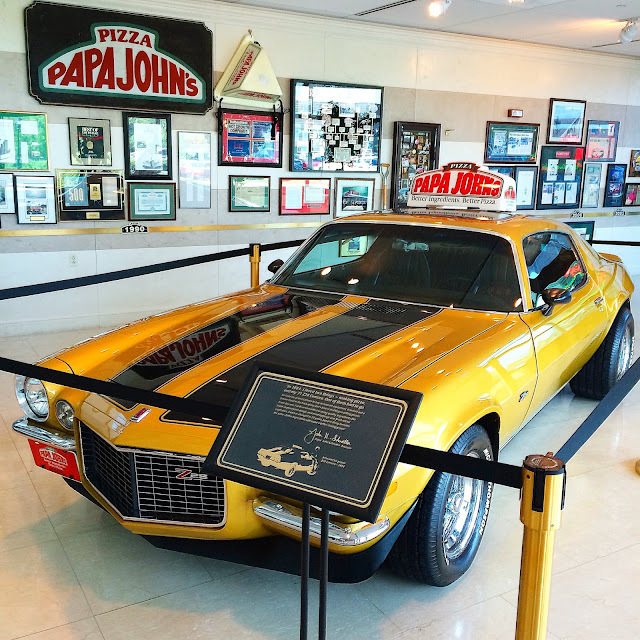 This is a replica of Papa John's 1971 Z28 Camaro. He bought the original for $1,600. Sold it for $2,800 to save his father's business. He bought it back in 2009 for $250,000. There is also tons of memorabilia from the beginning of the business. Including a replica of the broom closet the first pizzas were made in. Papa John came down to start our tour. He walked us through all the memorabilia in the lobby, and then we went behind the scenes! Our first stop was where they make the dough. Papa John's is the only quick service restaurant pizza company that makes their own dough. They have 10 facilities around the country. The mixer does a 2,050 pound batch every 10 minutes. They use filtered water, olive oil (only ones that use this), salt, sugar, yeast and flour. They can make 11,000 dough balls per hour. The dough is never frozen and is on its way to the stores within 2 hours of being rolled. After we saw the dough, Papa walked us around the office. They have a Starbucks on-site - all coffee is a $1. OMG! They have a salad/vegan bar and pizza store for employees. They also have a yoga studio and gym. There were employees working out with personal trainers when we were there. Crazy! There is a little drug store that you can pick up essentials if you need them before you go home. Papa John's has a doctor's office on site. Papa Cares is their employee doctor's office. Employees can go to the doctor anytime during the day and be seen within 10 minutes. No more waiting hours and hours at the doctor office. Papa asked if we wanted to see his personal office. It was beautiful! He is holding a signed football from the Manning's in this photo. He just got it that day. 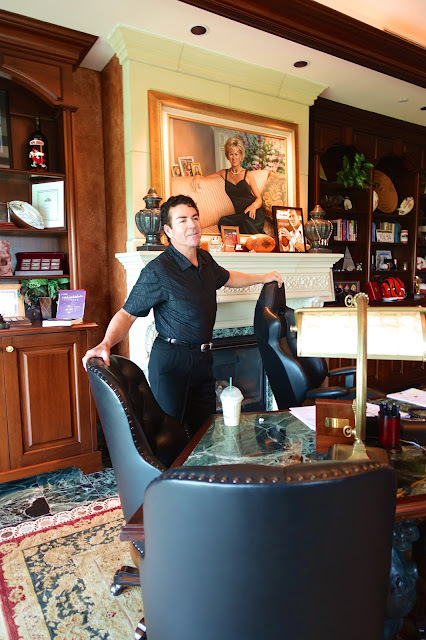 The photo above the fireplace is of his wife. 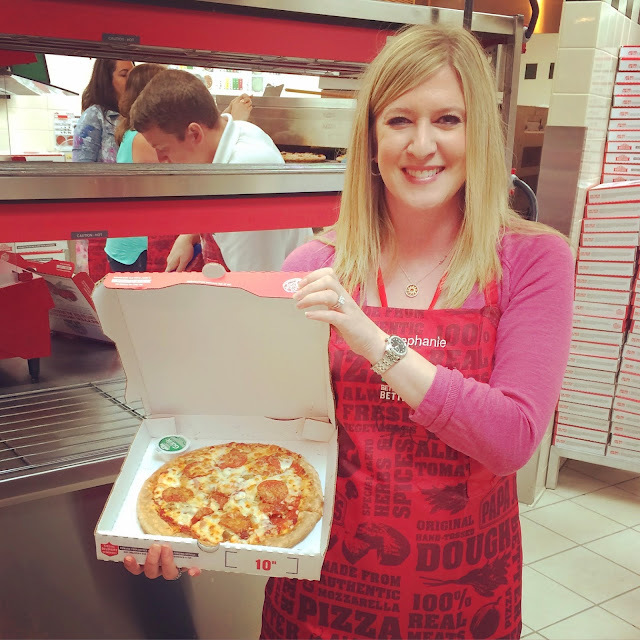 We learned about the Papa John's Mystery Shopper Program. Papa John's has people order pizza and document their experience. They take photos of the pizza and send them into Papa John's headquarters. 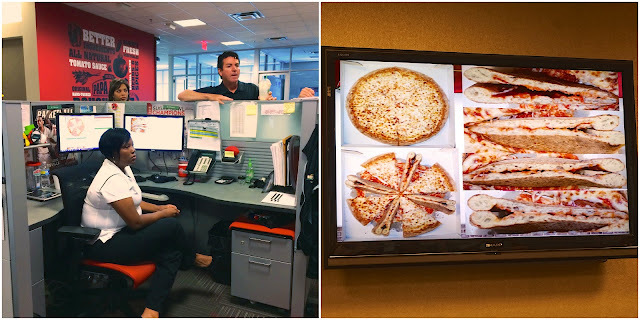 Team members at the headquarters look to see if they pizza is up to Papa John standards. Was it cut into 8 slices properly? Is the crust edge the right width? They also check and see if the crust was baked properly. Mystery shoppers cut slices of pizza with exacto knives and photograph it. Papa John's makes sure the dough was baked properly to achieve the correct rise. In addition to the mystery shopper program, Papa John's does quality control testing on all their ingredients. They random test their suppliers. They test the acid/sugar content of the sauce, they test the gluten in the dough, the protein in the meats. They even test the pizza boxes. Papa John's uses white on white pizza boxes. They found that brown boxes have a negative flavor transfer to the pizza. They use virgin white paper. They find the ink adheres better to it during printing. They actually test the ink transfer on the boxes as part of the random testing. Papa John's participates in the Sustainable Forest Initiative. For every tree used to make a box, a new tree is planted. Now it was time to taste all the ingredients! 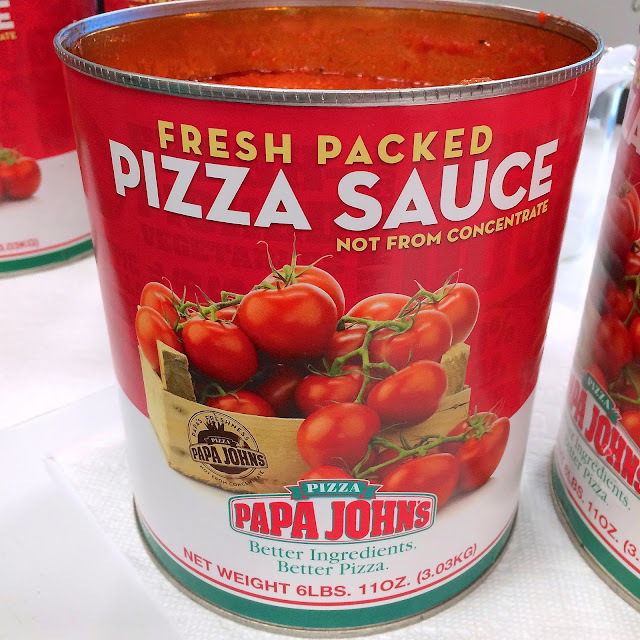 The sauce at Papa John's uses fresh packed tomato sauce. The tomatoes go from the vine to the can within 6 hours. The Papa John's sauce is a little sweeter than some because that is they way Papa John likes his sauce. Pretty good reason. I was surprised to learn how "clean" Papa John's pizza's are. 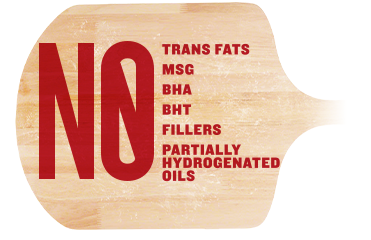 Papa John’s has no trans-fats, no MSG, no fillers in its meat toppings, no BHA, no BHT and no partially hydrogenated oils. 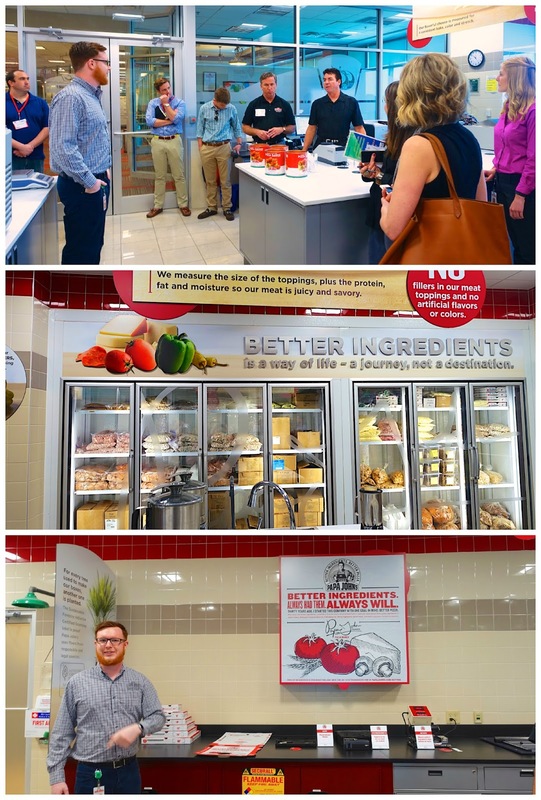 As consumers continue to expect greater transparency from the food industry and better ingredient choices, Papa John’s continues to look closely at its labels to ensure it is conscious of food trends without sacrificing the great taste its customers love and have come to expect. It was finally time to eat!! We got the sample the new Greek Pizza before it was rereleased. YUM. It had mozzarella, basil pesto, black olives, roma tomatoes, pepperoni, feta and banana peppers. It was really good. I especially loved the feta! 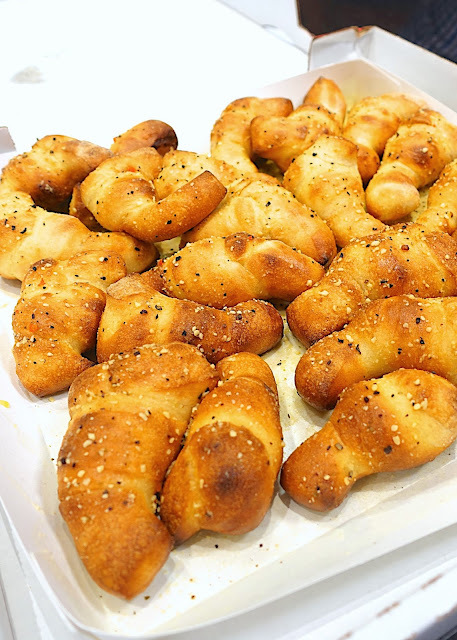 We also got to sample the Garlic Knots. Papa went and put on his red shirt and took photos with everyone. He also signed all of our aprons for us. Now it was time to learn how to make pizza from the Papa. He was definitely in his element in the kitchen. I made a Mighty Meaty pizza - Italian sausage, bacon, Canadian bacon, pepperoni, mozzarella, 3-cheese blend and Parmesan Romano. I wish I had access to their kitchen every day! Papa sent us away with some fun swag. It was a whirlwind trip, but so much fun! 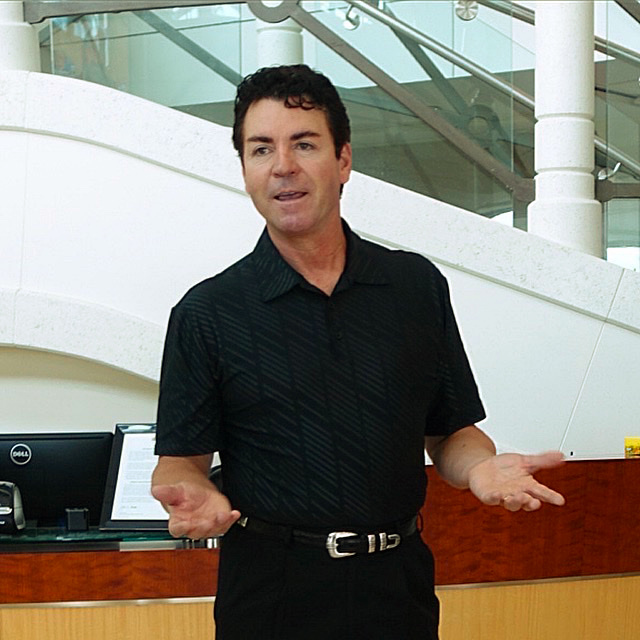 I had a great time learning about Papa John's Pizza. I was impressed at how transparent Papa John's Pizza was. They answered any and all questions we had. I truly felt that Papa John believes in making better pizza with clean and fresh ingredients. He really wants to serve the best pizza possible. Papa John's Pizza is working hard to remove additives from all of their foods. As I said earlier, their pizza is really clean. It is the sauces and add-ons that still have additives. They are working on those items as we speak. Overall, I was super impressed with the pizza and the company. I would have never guessed that a "fast food" pizza company had so many great fresh ingredients. I am thrilled that the restaurant industry is heading in this direction. 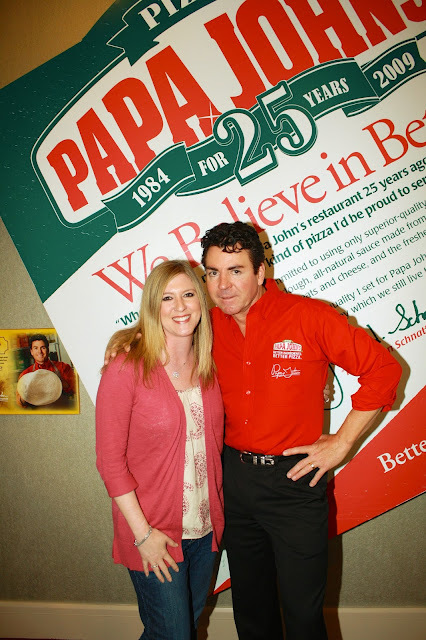 Papa John's Pizza did not ask me to blog about my experience. I just had a great time and learned so much that I wanted to share it with you. Thanks for the behind the scenes look and I also think it is unbelievable that THE MAN would tour you around. I was most impressed by that. Let's be real - I'm not eating pizza to be healthy. It is great the ingredients are getting so much better, but I was so impressed THE MAN spend so much time with us. I want to work there!! Or better yet, be one of their secret mystery shoppers :-) Thanks for the tour. So fun! First, it's obvious that John is very hands-on and is on-site all the time, which is great. And he's a real pro at tossing pizza! Second, you can let them know that this was really effective, because I'm totally craving Papa John's and I'm DYING to try the garlic knots, which I've never had before. Me too! I've been wanting Papa John's every day since I went on the tour. Do you know if they give tours to the public or school groups? I live near Louisville and our homeschool group would LOVE this! I love their pizza! This was a great behind the scenes tour. Thanks for sharing and giving me even more reasons to love their pizza! Loved your write up! I want to go back!